Fishing around the coastal areas and lakes might be fine for a while, but once you become a serious angler, you might need to look for something that will work in the saltwater as well. Even if you are not yet on that level, a versatile and multifunctional fish finder always offers much more value for your money in the long term. The Lowrance HDS-7 Gen3 fish finder is one of the top fish finders from the Lowrance Company to allow serious anglers to get into saltwater as well. However, it might not have all the features a commercial angler might look for, but it does offer many more features than some of the cheaper options on the market today. Fishing Tech happily gives the Lowrance HDS-7 Gen3 and overall rating of A. The Lowrance HDS-7 Gen3 comes fully packed with a 7-inch display and it features a touchscreen display. However, navigational buttons are also present on the side of the fish finder for users not fond of using the screen to select features. It features an 800H x 480V pixel matrix with a backlight that can be toggled from the keypad. The multi-window function has also been included, enabling users to see multiple different screens with stats and still have the view of the sonar to see fish passing by. It features a diagonal design, which has become the stable of the Lowrance series and an additional 16:9 ratio that display all the fish as icons as they pass by. If the sonar and the transducer fail to live up to expectation, none of the other features will really matter. Nevertheless, the Lowrance HDS-7 Gen3 features a CHIRP sonar with the StructureScan feature as well. The CHIRP sonar has a maximum depth range of 750-feet and operates on 83/200 kHz. For StructureScan it features a maximum depth range of 300-feet and operates on 455/800 kHz with a maximum range of 600-feet to each side. The fish finder also includes the TotalScan transducer, rated as the best transducer from the Lowrance Company and this transducer is necessary for using the StructureScan feature. Additionally, the transducer is capable of measuring the temperature of the water to detect whether or not you have the right location for the fish you plan on catching. Lowrance has been known for including great GPS systems in all of their fish finders and the Lowrance HDS-7 Gen3 comes with Insight USA charts that contain maps and charts of rivers, lakes and the coastal areas around the US. The Insight Genesis feature also returns and this enables the user to create custom maps and save waypoints to save and share on the app. The Lowrance HDS-7 Gen3 includes a highly sensitive GLONASS antenna for better accuracy and it is compatible with many other maps and charts that can be purchased online through the app. The built-in memory has the ability to store up to 5000 different waypoints 200 different routes to help you retain the locations of fishing hotspots. The Lowrance HDS-7 Gen3 features a built-in wireless connectivity, enabling the user to connect to the internet and download new maps to be stored for future trips. It also includes the GoFree Cloud app that can be used to share locations and maps with fellow users. The app can be downloaded onto your mobile devices to control the fish finder remotely if needed. The Lowrance HDS-7 Gen3 certainly lives up to the hype of the many users loving it. It is quite versatile and the design is not only stylish but durable as well. It features a waterproof rating of IPX7, giving it the ability to resist 1-meter of water for up to 30 minutes. The addition of the backlight makes it perfect to be used in any weather condition as well. The TotalScan sonar is one of the top sonars, impervious to virtually any weather condition and this also makes the Lowrance HDS-7 Gen3 perfect for fishing in the icy conditions of the Arctic. One of the main drawbacks is the usability and since it is extremely intricate, many users might find it hard to find and understand all of the features at first sight. While it does not have a massive depth range, the 750-feet it offers is plenty for rivers, lakes and the occasional saltwater fishing experience. We found the multi-window function to be extremely helpful when tracking the stats and keeping an eye on the sonar to ensure that you never miss anything passing by underneath. The fish finder can also be operated with one hand or remotely when connected to your mobile device. This makes it possible to remotely operate the fish finder and once you have connected the SmartSteer feature, there is virtually no way to get lost in the water. Serious anglers will definitely love the accuracy of the features as well. Finding something wrong with the performance is quite hard and the GLONASS GPS antenna is one of the most accurate on the market today and the ability to plot up to 5000 waypoints before even using the MicroSD card slots offers additional functionality over the usual 3000 of many cheaper models. The GPS is compatible with multiple different maps including the Navionics, all the Insight maps, and the C-MAP MAX-N+, but there are many others that you can download as well. The only downside is that everything needs to be purchased online and this could become quite an expensive venture to expand your library. The Lowrance HDS-7 Gen3 is one of the top fish finders created by the Lowrance Company and it features many of the features you would find in the high-end fish finder. Even though it is not priced too high, it is still one of the top fish finders and closely competes with the Elite series. The only drawback of the Lowrance HDS-7 Gen3 is the smaller screen size. The Raymarine a78 Multi-Function Display fish finder is one of the top Raymarine fish finders and it also includes a touchscreen display. The large display makes it easy to see anything that passes by, while the additional stand does add some portability as well. It is a little cheaper than the HDS-7 Gen3 and it is a little easier to use, but only features a maximum depth range of 600 feet. The Simrad GO7 XSE Chartplotter/Fishfinder is a uniquely designed and stylish fish finder that looks a little like a tablet. It is easy to use and navigate and features a touchscreen display system as well. It includes Bluetooth connectivity and the ability to connect to the internet if you need to expand your map library. The Simrad GO7 XSE Chartplotter/Fishfinder is a little cheaper, but also much larger than the Lowrance HDS-7 Gen3 fish finder. If you are looking for the best combination between quality and value for your money, the Lowrance HDS-7 Gen3 fish finder will certainly be one of the top fish finders you could choose. It has been fully equipped with all of the features one would expect in some of the high-end fish finders and it only lacks in terms of depth range. However, once you get it set up and understand the features, this fish finder is sure to become your best friend in the water. 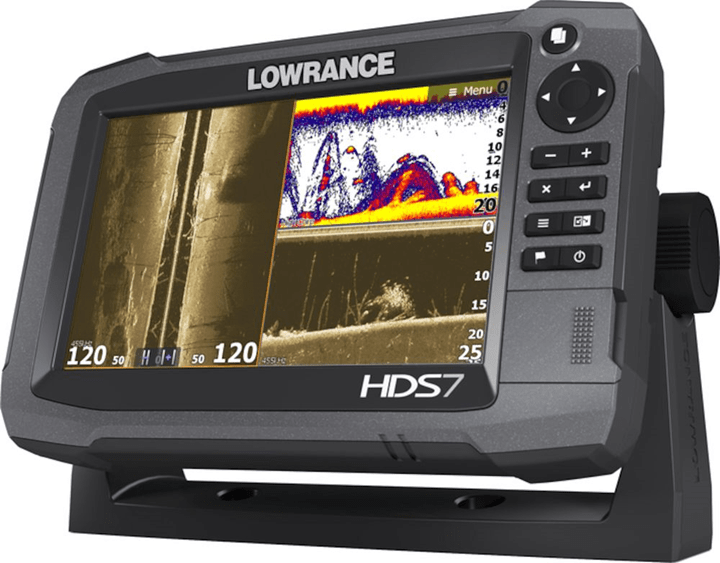 Fishing Tech Happily gives the Lowrance HDS-7 Gen3 fishfinder an overall rating of A and we would highly recommend it for the value and the affordability to the serious angler.